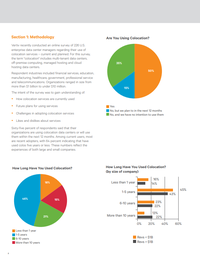 Vertiv recently conducted an online survey of 226 U.S. enterprise data center managers regarding their use of colocation services – current and planned. For this survey, the term "colocation" includes multi-tenant data centers, off-premise computing, managed hosting and cloud hosting data centers. Respondent industries included financial services, education, manufacturing, healthcare, government, professional service and telecommunications. Organizations ranged in size from more than $1 billion to under $10 million.